Are you looking for a guilt-free or gluten-free crunchy snack? You should try these Crunchy Roasted Corns! 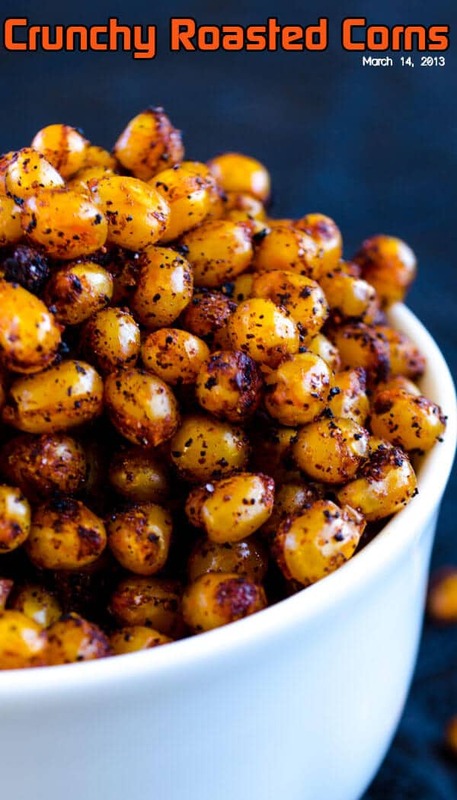 If you are always on the look-out of a healthy snack which is tasty at the same time, I guarantee you will love these addictive crunchy and spicy roasted corns. Do you love your snack sweet or savory? When it’s snack time, I mostly prefer savory and if it’s spicy too, my pleasure doubles! 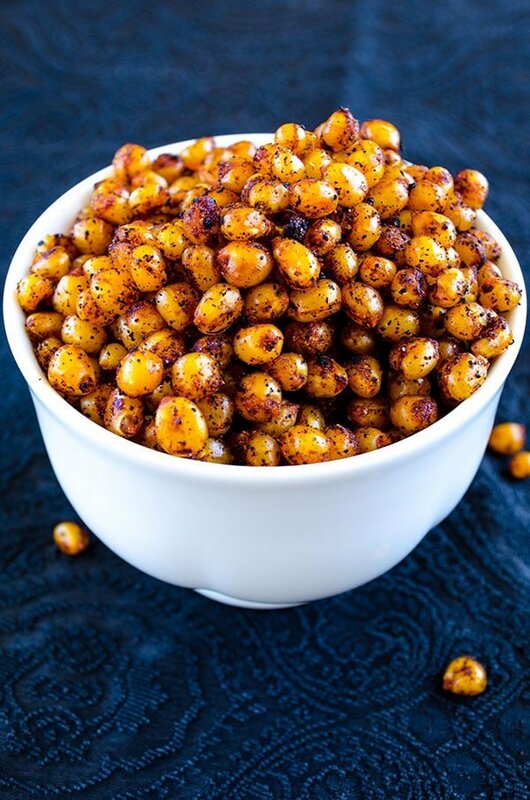 One of my favorites is Spicy Crispy Roasted Chickpeas, which is another healthy savory snack. And roasted corns are my second favorite. I normally love to pair these with a big mug of very cold beer, but I don’t drink these days as I am still nursing our little Göktürk. He’s already 10 months old! Can you believe that? Do you think dried corns are just used for making popcorn? Let me give you a secret. You have two other options with them. You can make either Buttered Corn with Chili or Crunchy Roasted Corns. Why don’t you make all three versions of dried corns and see the reactions of your guests? You can see which one will be loved more this way. My personal choice would be either the buttered ones or roasted ones since I love to chew corns as they are and I find these tastier, but Yusuf and my mom always prefer popcorn. I haven’t tried making these with frozen or fresh corns, but I don’t think it’s a good idea as they may not get as crunchy. I spiced up these corns with chili powder and salt as I like this combination, but you can add curry powder, Turkish 7 spices or some herb spices too like dried thyme or rosemary or whatever you like in your savory snacks. These spicy and crunchy roasted corns are amazing when hot, but they are great when cold too. So you can make these with your kids’ favorite seasoning and put in their lunch box. They can enjoy these corns during breaks. Much better than store bought chips, right? I’m sure their friends will come over to ask for more! 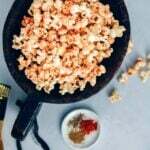 A healthy, gluten-free, spicy, crunchy and addictive savory snack with corns. Soak dried corns overnight and cook them in a pressure cooker for 30 minutes. Heat a non stick pan and add olive oil. Toss in corns and sprinkle salt and chili powder over them. Roast corns over high heat shaking the pan occasionally until crunchy and golden. Hi, if I don’t have a pressure cooker, what’s the best alternative to cooking the dry corn kernals? Thanks. I loved your comment that you were still nursing your 10 mo old, congratulations! Any thoughts on using fresh corn kernels? I am in the United States in the corn growing part of the country and corn season is coming up! I am very interested in trying this recipe, but I am not sure what you mean by dried corn. Could you tell me more about it please and where you can buy it. Thank you so much. It looks like something my sister tried in California and I want to recreate it for her for Christmas. Well, I mean corn kernels, but not the fresh ones. These are also known as bulk dried corn, removed from the cob. You can find it online stores like alibaba. Hope this helps. I drain a can of whole kernel corn and fry the kernels in oil until they are dried, then I add salt, pepper and chopped onion. It sounds good with chili powder though. I was thinking of using a food dehydrator to do it. Never thought of it. Would love to hear the result when you try. Bir dakika! Patlamış mısır için olan mısırdan mı kullandın? Eğer öyleyse süper olacak çünkü.. Düdüklüde piştikten sonraki hali nasıldı, haşlanmış haliyle salataya falan katılacak hale geliyor mu? Evet patlamış mısır için olan mısırdan kullandım. Haşlanmış haliyle süt mısır kadar yumuşacık olmuyor ama yine de yumuşak oluyor. Biz salatada da kullanıyoruz, çorbada da. Hatta avokadolu mısırlı mücver bile yapıyoruz. Tarifi sitede bulabilirsin: Corn and Avocado Fritters Harika oluyor.